Having spent two weeks on Paul’s message in the 8th Chapter of Romans, I feel a need to come back to Mathew’s Gospel as my focus. It’s hard to avoid commenting on the Feeding of the Five Thousand. It’s one of three Gospel stories that somehow everyone knows. It’s the only miracle story to appear in all four gospels, though each Evangelist applies his own spin to it. I say it’s hard to avoid, because for me, it’s one of three really famous Gospel stories that have embedded in popular consciousness. There is the parable of the Good Samaritan and there is the parable of Prodigal Son. I always want to rename the parable of the Prodigal Son as the parable of the Gratuitous Father because it says far more about the father than the wayward son. All three parables have something to say about God as a God of gratuitous actions. I am curious about the word gratuitous. I am finding a need to rehabilitate it in my own imagination. The word gratuitous, I associate with bad things – gratuitous cruelty, gratuitous violence. The word has two distinct, yet linked meanings. The first meaning is: something uncalled for, something that is inexplicable, something lacking good reason. So the word associates for me with actions that seem to us inexplicable. The second meaning of gratuitous associates to good actions, e.g. he gave his time free of charge, or she freely offered me the use of her car. The link between the two meanings lies in the notion of actions that are inexplicable actions, freely chosen. Why do some people do such cruel and violent things to others? Why would someone give freely when there is no obligation to do so, or when there doesn’t seem to be any obvious benefit for them doing so? Both cruelty and generosity are gratuitous because both seem inexplicable. Yesterday, I enjoyed a conversation with a soul-friend because it was the first opportunity we had, had to catch-up with one another since my leaving Phoenix. As we came towards the end of our conversation I asked her why she thought the members of the Tea Party were so opposed to allowing the refugee children on our southern border to enter the country? My mentioning the Tea Party was, of course, somewhat teasing, as my friend is a person who is both socially progressive and fiscally conservative. Clearly, the reason I like to tease her is that at some level I am infected with that insufferable liberal trait of thinking I have a monopoly on compassion. Her answer was that it wasn’t just the Tea Party who opposed the entry of the children, and I am sure she is correct about that. The Congress has just adjourned leaving the Executive branch of government to grapple with this painful national dilemma. My friend countered with: its hard but we need law and if you have a solution to this situation, then please share it with me, because I do not know what the answer is? It goes without saying, that I have no solution. Sending them back seems bad, yet, taking them into our already overwhelmed and overstretched public welfare and education systems, seems also a bad decision. As a foreigner, but one who has had the skills, resources, and the institutional support to negotiate the complex processes of legal immigration, I feel a particular solidarity with those who don’t possess what is needed to negotiate legal channels. As a foreigner, I also recognize that the immigration debate exposes a wound that is particularly raw for Americans. Like the US, the UK, the country I am most familiar with faces similar challenges, as do all the countries of the European Union. These words, engraved upon a bronze plaque in the Statue of Liberty, have over the course of the early 20th Century become etched upon the American psyche. Herein, lies the particular American, immigration dilemma. These words remain etched upon the psyche of a nation that no longer feels it has the confidence to remain faithful to them. Words of hope have become words of guilty rebuke. Immigration and class mobility are two regions straddling the fault-line separating the traditional national mindset of unlimited abundance and the growing fear of scarcity that has already dramatically eroded a culture of national self-confidence. Waves of seismic energy radiate outwards from this fault line, seriously damaging the foundations and superstructure of the melting pot culture and its body politic. A national psyche rooted in a soul-vision of America as a refuge for the oppressed and a land of opportunity for the self-motivated has historically gone hand–in-glove with a nation ever-expanding to fill-up it’s vast landmass and develop its resources. Since 1945 this dream as been fuelled by the US economic and military preeminence in the world. Historically, the national dream of manifest destiny and the economic imperatives of nation building, dovetailed. The lines of this history can be seen at every turn in a state like Rhode Island, a patchwork of ethnic identities flourishing within a concept of common cause and the common good, fuelled and sustained within a framework of economic opportunity. Alas, because of globalization economics no longer dovetail with the American Dream. The agencies of the national religion of capitalism, which had been assumed existed to serve the American Dream, have either abandoned these shores or walled themselves into unassailable transnational ghettos, from which they pursue policies designed to increase the wealth of Wall St at the expense of Main St. The result has been a shattering of national confidence in the assumptions of easy abundance as everyone hunkers down in a landscape devastated by fears of scarcity. In a landscape of scarcity notions like compassion for the outsider become the first in a long list of moral casualties, along with a belief in common cause and commitment to the common good – a recognition that ultimately my flourishing is limited, if it is at the expense of yours. In chapter 14, Matthew arranges three powerful juxtapositions. He opens with the death of John the Baptist during an evening of gratuitous (there’s that word again) abundance. Herod’s party has become for us emblematic for excess and depravity, both marks of unaccountable and parasitic, privilege. The chapter’s middle section concerns Jesus’ reaction to John’s death. In distress he escapes into the desert, only to be followed by the crowds –some 5000 men, plus women and children – note only men are counted in the Old and New Testaments. Here Matthew recounts the memory of Jesus performing a miracle in feeding 5000 people (a symbolic figure representing the organization of the Israelites into groups of 5000 recorded in Exodus) with two fishes and five loaves, the very antithesis of Herod’s abundance. The chapter closes with Jesus walking on the water in the midst of a storm. Jesus is not only a miracle worker who demonstrates abundance in the midst of scarcity, he asserts his authority over the very elements of wind, sea, and darkness. Even in the face of such assertions of authority, such a promise of assurance that all is well, Peter’s courage and confidence fail him. For Matthew these sections are theologically connected, though he doesn’t explain exactly how he understands the connections between them, it is reasonable to assume that the feeding of the five thousand is, in some sense, a prefiguring of the community meal of the Eucharist. Matthew seems to present us with two different kinds of banquet. There is Herod’s banquet of excessive abundance. Here we see the powerful and the privileged’s callous disregard as an expression of the hardening effect of excess on their hearts. This is an image of moral scarcity amidst material over-abundance. Next, Matthew presents Jesus’ banquet, set amidst the scarcity of landscape and provision. Here the very scarcity in which the peoples lives were lived leads to a discovery of a kind of abundance that invites hearts to open in the face the surprise experience that there is enough for all. 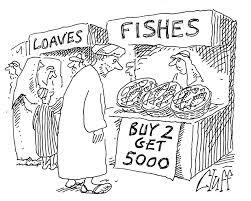 What can the parable of the Feeding of the Five Thousand mean for us? While not wishing to tie its meaning-down, it speaks directly to our national failure of confidence. We no longer trust to our own ability to self-generate a culture of abundance and therefore humbled, we cower before our fears of scarcity. The shift in the relationship between the American Dream and the economic winds of change reveal that it’s not the newfound limitations on material prosperity we need to worry about. Other nations have found that a return to a belief in common cause and practices that support the common good are effective responses to limitation of material resources. Our concern should be with the loss of our moral confidence as a nation. The chasm left by the loss of moral confidence is filled with our fear. Fear stifles our ability to work together, to imagine our way out of the box. Loss of confidence and impoverishment of imagination pose the real dangers for the American Dream. After all, as I was mentioning in a very different context last week, reality isn’t real, its only the way you see, or don’t see the world. What we are failing to see is that we are generating our own fears as a result of our worldview. We mourn the loss of easy, self-generated abundance and perceive scarcity as something imposed on us from beyond our control. This is an illusion. So too is the resulting fear that we need to keep immigrants out because there are not enough jobs for citizens. Abundance is fuelled by the dreams, creativity and hard work of immigrants; just look back several generations in any American family to see how this works. A prosperous middle class with spending power and strong civic-minded priorities likewise fuels abundance. We have forgotten that abundance is found in the midst of material limitation where a society’s imagination is unleashed to solve problems through people working together. America’s enjoyment of easy, seemingly limitless abundance is an anomaly in the long march of Western Civilization. European – Western progress was fuelled not by the enjoyment of an easy material abundance, but by the imaginative technologies that arose to meet needs in the face of natural and material limitations. The problems on our southern border and the larger problem of worldwide population migration will not be addressed with easy, one-step solutions. Part of the solution lies in the development of new kind of national confidence, no longer resting on an expectation of easy abundance and success, but a renewed confidence fed by imaginative courage and gratuitous (there’s that word again) action. Remember the first definition of gratuitous means: something uncalled for, something that is inexplicable, something lacking good reason. Remember gratuitous also means: giving freely when there is no obligation to do so, or when there doesn’t seem to be any obvious benefit in so acting. Now let’s locate these definitions within our own intentions and actions. Gratuitous means challenging our intentions and actions when driven only from the narrow perspective of protecting our own self-interests. Our own sense of narrow self-interest is a prison that saps our courage and makes our gratuitousness cruel and not generous. If you doubt my assertion simply open your eyes and look around. As you do so, don’t forget to look within. Matthew 14 highlights two approaches to living. It’s clear to most of us that we are no longer living in the world of Herod’s party, party, party banquet. Can we move from a national mindset addicted to excessive abundance, driven by the need to feed our insatiable appetite without regard to the effects on other nations and peoples? The second and more difficult question is: can we begin to shape our world guided by the banquet Jesus shows us that we could enjoy? Or will we, like Peter climbing out of the boat, find our courage and confidence in God, failing us? We can’t forget that a sizable component to solving the plight of Central American refugees from violence and poverty lies in a more imaginative response to our epidemic use and abuse of narcotics. Out abuse of narcotics fuels the wide scale corruption and gratuitous violence eroding stable civic and economic life from the Mexican border south. Realizing the Future, Seeing and Hearing Our Way into the Mind of God. in penning this blog. I really hope to check out the same high-grade content from you in the future as well. I trust you will go for it and launch yourself into your blog! Glad to be a source of encouragement.